Click here for direct link to audio Episode #11. 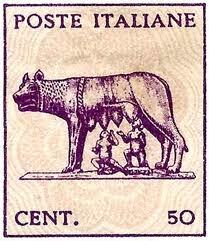 This stamp depicts the famous Capitoline statue of Romulus and Remus and their wolf-mom. These twin baby boys were sons of Mars, the god of war, and Rhea Silvia. 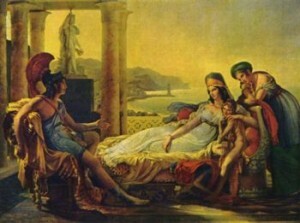 Rhea’s uncle, for complicated reasons, threw the babies into the Tiber River and imprisoned their mother. Another version of the legend has Rhea Silvia thrown into the river with her boys and she becomes the wife of the river god. In any case, the boys bob around in the water for a while, get tossed ashore, and are found by a she-wolf. The lady wolf raises the twins until the proverbial shepherd comes along and takes over the task. The boys grow up and start to build their own city, but sibling rivalry rears its ugly head! Romulus has his own ideas about the way things should go, quarrels with Remus and kills him. Romulus names his city Rome. One version of this foundation myth has Romulus and Remus as sons of Mars and Ilia, who was the daughter of our very own Aeneas and his newly-acquired ladylove, Lavinia. Does anyone besides me prefer Turnus to our Trojan prince? Here’s Hollywood’s take on the story! Eeekkk! These ancient tales! Divine parentage, abandonment, exposure, feral children! Today’s podcast is the final installment of The Aeneid. Enjoy! Click here for direct link to audio Episode #9. Today we begin The Aeneid by Virgil, who actually wrote it at the request of Augustus Caesar to link the citizens of Rome to the heroes of yore. Enjoy the first of three installments of the epic, The Aeneid. Next week, you’ll learn all about this famous tale and why Queen Dido of Carthage is one of my favorite female warrior queens of all-time! Spent 5 days in L.A. at the Society of Children’s Book Writers and Illustrators (SCBWI) convention, and can honestly say it was the most magical five days of my writing career. I met so many wonderful career writers it was amazing. I went to 8 workshops given by authors such as Jon Scieszka (of Stinky Cheese Man fame), M.T. Anderson, Gordon Korman, and Gennifer Choldenko (Al Capone Does My Shirts). I went to a booksigning with 44 kidlit authors. I attended a show for children’s book illustrators. I heard 13 keynote addresses. I listened with great interest to 4 panel discussions by industry insiders. 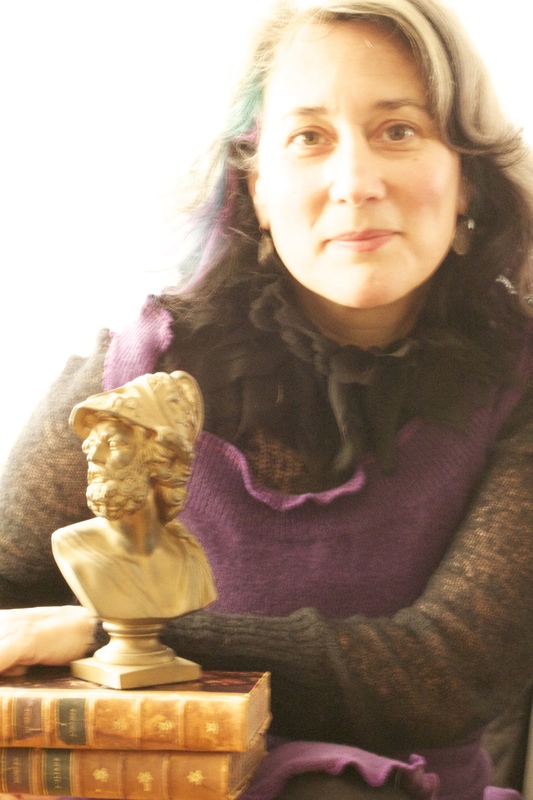 Seven years ago or so, I read aloud to my classes Paul Fleischman’s 1996 book Dateline: Troy. This remarkable book narrates scenes from The Iliad while including newspaper clippings of modern events that mirror the issues addressed in that most famous epic. If you’ve ever read aloud to anyone, you know how exhausting it can be. Multiply that by three classes for a week and a half and you see what I went through. I desperately wanted my students to know the story of the Trojan War, and they loved the story and Paul’s book, but it took so long to read it out loud! As I looked around at their tired faces, I knew I had to find a better way. So, that summer, I broke my leg roller-skating, and while I was laid up in bed for 3 weeks after surgery, I wrote a 40-minute play of The Iliad so that my students could act it out. I modeled it on some Shakespeare adaptations I had used from an old Scholastic book. Back to school that fall, I knew I had a hit on my hands as the kids showed their enthusiasm for all things Homeric and we started to collect plastic swords, shields, and helmets for the productions! If you look in my book, Read Aloud Plays: The Iliad, The Odyssey, and The Aeneid, I dedicated the book to that first class who made my work come alive onstage and make a special note of thanks to the first boy who played my Achilles. 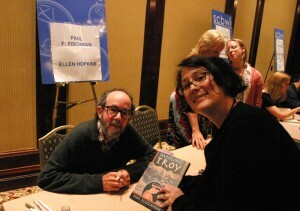 I took my copy of Paul Fleischman’s book Dateline: Troy to L.A. with me this past weekend and had him sign it. I told him how his book inspired my book because I had to get the kids involved in the story. He was amazed to see his book and told me no publisher would take it and that he was rejected over and over again. He said the only reason he got it published was because he sent it to Candlewick Press, a new kid on the block in the publishing world, and they were willing to take a chance on it. I gave him a copy of my book and signed it with gratitude. You undoubtedly know Paul’s father—the famous children’s book author Sid Fleischman. Here is a treasured photograph of me with Paul. Thanks to Peter Linenthal for being there with his camera! Special thanks to Mac McCool, graphic novelist extraordinaire for giving me a copy of Herakles, the graphic novel made by his college students. Mac has published a bunch of kids’s books and he teaches illustration and sequential art at a university in California. I am sending him a copy of my book in return for his generous gift. I met so many amazing people. I’ve never been to a professional gathering that was so supportive. I met the children’s author June Sengpiehl and her husband Paul Sengpiehl. Over lunch one afternoon, Paul recounted his years learning Latin in high school with his Latin teacher Lois Fischer, who taught her students this mnemonic for remembering the stages of Roman history: K-R-E-2-5-4. That is: Rome was a kingdom for 200 years, a republic for 500 years, and an empire for 400 years! How exciting! Thank you to Paul for sharing that memory device. I will certainly pass it on to my students and our 6th grade ancient history teacher. And the best part about the whole weekend, I let go of a project that had hit some serious walls and was keeping me from moving on to the many other exciting writing projects I am working on. This is a good life lesson: sometimes it is better to give a thing up than to hold on and get dragged down with it. Several years ago, my good friend Peter Linenthal asked me to write a children’s book for him and he would do the illustrations. We worked very hard over a long, long time, but publishers and agents prefer to choose their own collaborators. They typically pair a lesser-known illustrator with a better-known writer or vis versa, in the hopes of giving as much support as possible to the project. I hope Peter finds a home for Jaya in the coming months so that he can get to work on the final art work. And thank you, Peter, for the gift of that amazing convention!